Dallas, Texas-based Steve D. Wilson made a name for himself with the band The Black Doves. With the band, Wilson created a style that alternated between Alternative Rock and ballads. But with time, everything changes. And the same thing can be said for Wilson, as the singer-songwriter finds himself creating another release. This time, however, Wilson is on his own as the band has gone its separate ways….at least, for now. So to fill in the sound of his music, Wilson has called on several people to create the sound and feel of a band. Together with Wilson, the rest of the musicians include: bassist Sam Hudson, guitarist Dan Conrad, keyboard player Theodore Allison, drummer Joe Varela, Keith Brown on strings and Becky Newman adding harmony vocals to the songs. These musicians have helped Steve Wilson create a new release called Discovering Gravity. The new release from Steve D. Wilson begins with the song “Perfect”. The song contains Wilson’s signature acoustic/electric rock that was so much a part of the Moments of Clarity release from The Black Doves. The resulting song creates a bridge that seems to take the listener from the 2008 release from that band and brings them over to today without losing much of what fans of that band liked about their music. “Perfect” still contains the vocals from Wilson that feel so effortless and emotional. It is on the song “Mess of Me” that the landscape seems to change. While there is still a little bit of The Black Doves in the music of the song that might simply be because of Steve D. Wilson’s vocals. The song contains a rock ballad approach to the music, and with the addition of Becky Newman on harmony vocals, the song ends up being one of the most commercial and radio-friendly tracks of the five songs on the release. Listeners to Top 40 radio back in the early 80s will no doubt recognize the song “Bringing on the Heartbreak” that was originally done by the British band Def Leppard. For this version, it is Theodore Allison’s keyboards that help create the majority of the music for the song. The updated version of the song from Steve D. Wilson still contains much of the magic that came from the original single, while still containing some of the sound Black Doves fans are familiar with. The combination of the two styles on the new track shows what can happen when someone decides to do a cover of a single…..in their own style. 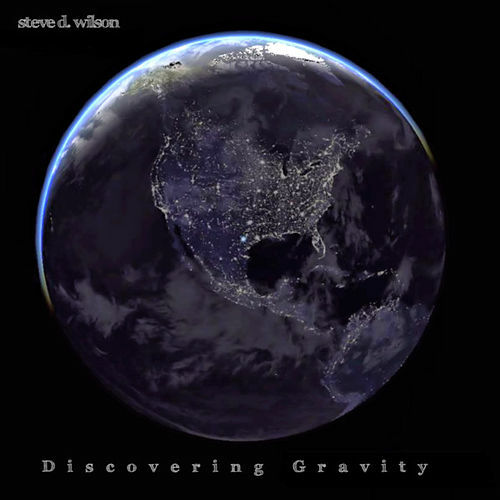 “Superstar” is another song on the new release Discovering Gravity from Steve D. Wilson that has a very commercial feel to it. With the addition of some electronic elements in the music, the song also has a slight feel that makes it seem like something from the 90s. While there is a slight “retro” feel to this track, it also feels fresh and would still fit right in with today’s radio formats. Discovering Gravity from Steve D. Wilson comes to a close with “Cold Steel Rain”. “Cold Steel Rain” is yet another song that tugs at the heartstrings. The keyboard from Theodore Allison is the main part of the music of the track, creating the perfect background for the vocals from Wilson. While it’s sort of sad another album from The Black Doves was never released, this new EP of Discovering Gravity from singer/songwriter Steve D. Wilson from that band makes up for that. And with each song being composed by Wilson with the help of guitarist Dan Conrad and keyboard player Theodore Allison, the five songs contained within the CD have enough familiarity to them while taking the music in a different that fans of Wilson’s music, new or old, will enjoy the new CD. Click HERE for a review of Moments of Clarity for Wilson’s band The Black Doves.